If filming Mike Gunther and his restless souls in a swirl of burlesque dancers ain't livin', brother you can shoot me dead as I stand. I was ostensibly D.P. of this little fandango, and my pal Suzanne provided direction and wine when she wasn't banging chains on an oil drum. Video geek rundown: VX2000 and GL2 on tripods, PD100 handheld by moi (from which these stills were taken). I just love this scene. 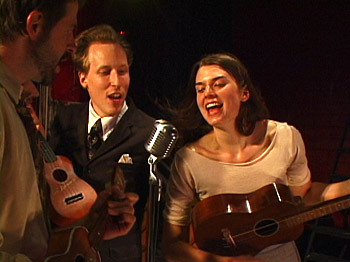 After we were all done shooting and most of the dancers had left, we shot the whole band playing the song with ukeleles and they found a whole new life. We all had big smiles on our faces. These are the Tin Star Sisters. The cigarettes are fake. The aura of cool is real. any other videos you've worked on in the past year?? are you editing this video too?? Why, that's the whole reason we did it! I believe Suzanne will be editing this at my place while we're in Missouri for the weekend... I'll help finish it up when I return, and apply some After Effects/Magic Bullet action.